Over her years working as a film and TV producer and director, and as a playwright, Melody Bridges has met many talented creative women. After having her son and moving out of London, Melody needed a way to maintain and grow her connections – and spend time with like-minded women. So she formed the successful networking group TNT: Dynamite Ladies. We find out how she went about it. I studied at Cambridge University and went to drama school at Mountview Academy. This lead to a dynamic and adventurous career in theatre and television as a performer and director. I made three factual television series in London before I moved to New York to study to become a film director. What happened after you had children? After a fantastic first year on the film directing course at New York University my son arrived! I chose to move back to the UK with him rather than to complete my studies. Back in London with a small baby, a theatre play splurged fully-formed out of my head and before I knew it I was a writer. This first play – ‘PUSH! a new play for anyone who’s ever had a mother’ – was recently performed at Theatre Royal Stratford East. So far in 2013 I’ve had six plays on at new writing events in London and Brighton so I’m refocusing my career from directing to writing – exciting times! Why did you start TNT: Dynamite Ladies? We moved from London to Sussex for family health reasons and it’s dramatically improved the quality of our lives. However I’m a native Londoner and I was worried about leaving my network group and circle of friends. I wanted to have a regular way to connect and so TNT: Dynamite Ladies was born. What was the idea behind TNT? I knew that I had A LOT of creative friends – directors, writers, artists, producers and so forth – and that I loved getting them together. However the only real time to bring people together is birthday parties and that’s not always the best situation (at 10.30pm after a few drinks…) to introduce people who could creatively spark off each other and possibly collaborate. Our TNT: Dynamite Ladies group have been meeting monthly at an exclusive private members club in London. We meet from 2-4pm on Sundays, which is a good slot as it’s after lunch and not too long for members with small children. Many of the members of our group are freelancers so for them it may be the first time in a while they’ve had face-to-face contact with an adult – and grown-up conversation! I created a few easy ‘getting-to-know-you’ tasks so that people get to chat in a relaxed and easy way. It’s not like other networking events – there’s no points scored for having laminated business cards – it’s a warm, friendly environment where women can – and do – plan how to take over the universe… (joking…ish). We regularly extend our membership to creative women in the arts. We’re most interested in bringing in new members with four plus years of experience in their chosen profession – not starting out. The women in the TNT network group are from very diverse backgrounds across the creative industries: artists, film producers, actors, singers, writers, TV presenters, radio producers and many more. When I started the first session I didn’t know if everyone would get along and chat. Now I have learnt that it’s not hard to get a group of creative women chatting! Wait – is this expensive? Nope. I’m just about to introduce an annual membership fee of £10 to cover administration costs. I have been running the group for free but I think we all place more of a value on something we pay for. We have over 100 members – although most monthly meetings are attended by 10-20 people. There’s a lot of chatter through our (private) TNT members page on Facebook. TNT was never intended to be a profit-making venture and is about encouraging peer-to-peer support. What kinds of successes have the group had? Well for a start lots of new friendships have been formed! Perhaps the most exciting area of development has been the increase in confidence that I’ve seen. Every lady shares what it is they hope to achieve in their own career by the next meeting and it’s amazing how saying this out loud and committing yourself motivates people. I always say – ‘Don’t come to the group for me, come for yourself. Come and make a promise to yourself and then keep it.’ I can’t explicitly state some of the successes that we’ve seen in the last year as there is a code of privacy, and also I don’t think I can take the credit, but let’s just say the some of the ladies careers’ have changed STRATOSPHERICALLY since we started! I want to start my own networking group. Where do I start? Try to choose a quiet meeting place where there won’t be too many interruptions. Hotel bars are great places to meet, as are private members bars. Staff are happy to bring you drinks when you ask, but they will not bother you if you just want to talk with each other. I think it’s also possible to do this in your own home, but you have to consider how easy it is for people to travel to your home and whether you might have other distractions in the place you live. For many of our group, TNT is about getting away from home life and talking about dreams – and how to make those dreams come true! 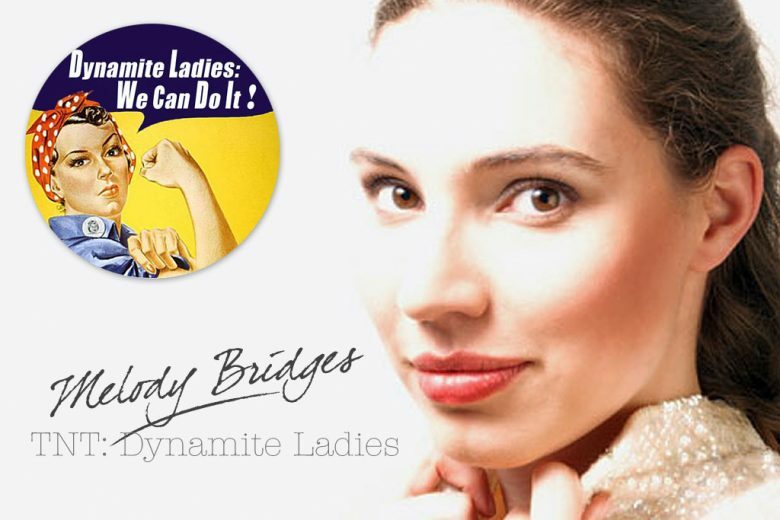 To join TNT: Dynamite Ladies send a 50 word biography of yourself to melody@melodybridges.com. You can also find out more about the group on their website.